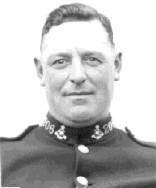 On the 1st January 1923 Police Constable 131 George William Blake was awarded the King's Police Medal. On the 21st February 1921, He was riding his bicycle along a country lane at Chesham when he saw a runaway horse and trap, with a lady occupant, racing along the lane. He pursued it for over 500 yards on his bicycle, and after the third attempt brought the horse to a stop, despite the fact that the front tyre on his bicycle had burst during the chase. Constable Blake thereby saved the lady from very serious injury, and also avoided injury to himself. awarded the Kings Police Medal 1934. Just after midnight on the 27th March 1933 Police Constable 56 Albert Howlett was on the main A40 Denham Road when he heard the sound of a motorcycle approaching from a nearby housing estate his suspicions aroused he called for the machine to stop, but it did not yield. A short time later he again saw the machine and realised that the machine, as it approached, was being ridden directly at him. The officer realising his predicament threw his pedal cycle at the motorbike causing it to crash. The motorcyclist got up and ran off with PC Howlett in pursuit. The suspect turned and discharged a firearm at him but the PC Howlett continued to follow. Eventually the suspect tripped and fell into a ditch, the officer jumpted on top of him during which the man tried to throw away the revolver, but the constable was able to arrest him. When PC Howlett searched him the man was found to be in possession of house breaking equipment as well as the revolver. awarded the King's Police and Fire Service Medal 1941. On the afternoon of Monday 30th December PC Stapleton went out on his cycle 'in consequence of a telephone message received,' and noticed a man who aroused his suspicions. The Constable questioned this man about the contents of two suitcases in his possession and, not being satisfied with the replies, asked to see his identity card. The suspect brought out instead a small revolver and said, " Keep away from me or I'll shoot." The Constable advised him several times to put it away and finally drew his truncheon, whereupon the man made off. PC Stapleton gave chase, although the fugitive turned several times and threatened him with the revolver. After a chase of two miles through cottage gardens and fields the Constable took a lift on a motor car, headed the fugitive off and lay in wait for him by a fence, armed with a fishmonger's steel. As the man climbed the fence, PC Stapleton struck him on the head, seized the revolver and threw it away. After a struggle the suspect gave in. The revolver was found to be a dummy, an exact facsimile of a Browning 6 m.m. automatic. The prisoner had a list of ten previous convictions, including one in which there were two cases of shooting. awarded the British Empire Medal 1965. 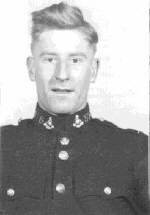 At 7:50 am on 10th February 1965, Police Constable 545 John Woolley received a report that a man had gone berserk at a house at Brill. He rushed to the house and on arrival at the house found the man in the garden and as PC Woolley approached he saw the man was in possession of a double barrel shotgun. The man put the gun to his shoulder and pointed it the constable shouting, "Someone is going to get hurt". The officer spoke to him and tried to subdue him and eventually got close enough to take the gun away. Whilst PC Woolley was hiding the gun, the man went into his house and got a long-handled tree-felling axe and started to smash up the room and hack up the mantlepiece. PC Woolley tried to reason with him and managed to get the axe. The constable then had difficulty in keeping the man away from two cut-throat razors and a bill hook. The house was completley smashed up, all the windows were broken; a cooker and refrigerator had been torn out. The officer managed to call a doctor and an ambulance arrived but there was great difficulty in persuading the man to go into it but he eventually did and was conveyed to hospital. For around two hours PC John Woolley was alone with the man and throughout remained in control despite constant provocation. He showed extreme courage resourcefulness, patience and common sense in the most difficult of circumstances. awarded the British Empire Medal 1967. Detective Constable 501 Terry Lee with his wife at the presentation of the British Empire Medal by the Lord Lieutenant of the County 1967. Detective Constable 501 Terry Lee was on duty with a Detective Sergeant when they saw a motor car parked in an entrance to a private drive. A man was sitting in the drivers seat and a girl in the front passenger seat. D/C Lee went to the car and stood a few feet in front of it. The sergeant announced that they were police officers and that he wished to speak to the occupants. The driver of the car moved it forward and D/C Lee waved his arms at him and asked him to stop. However, the driver drove straight at him. D/C Lee threw himself on the bonnet of the car that was driven onto the main road at a fast speed. D/C Lee remained on the bonnet of the car lying on his stomach holding onto the windscreen wipers. The car travelled very fast in this fashion for about a quarter of a mile when the driver suddenly braked hard and stopped almost throwing the officer of the bonnet. The driver got out the car and threatened D/C Lee who slid off the bonnet and attempted to restrain him. A struggle ensued but the driver freed himself and re-entered the car. D/C Lee tried to open the door but the car moved forward and he again jumped onto the bonnet and was carried a further half mile. During this time the car was driven at high speeds and swerved violently from side to side. Eventually the driver stopped, got out and aimed a kick at the officer who slid off the bonnet to avoid being struck. The driver quickly re-entered the car and began driving away, but D/C Lee wrenched the rear passenger door and jumped in. In the rear of the car he found two pillow-cases containing a quantity of silverware. He tried to reason with the driver to stop the car and give himself up but he continued to drive at high speed until he stopped suddenly, jumped out of the car and ran off into a crowd. The girl passenger also ran off but D/C Lee managed to stop and her arrest her. The driver who made good his escape was later arrested. 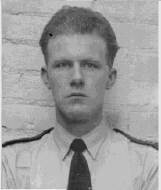 Police Constable 378 Robert Megson was commended by the Bucks Assizes on Wednesday 4th October 1967 for his "extreme courage" in disarming a youth who, seconds earlier, had attempted to fire a loaded pistol at him. The 16 year old Dunstable youth was sentenced to four years detention for attempting to cause the officer grievous bodily harm by attempting to fire the loaded pistol at him on August 29th 1967 at Marsworth. The offending youth together two others aged 16 and 17 broke into the Manor at Marsworth and stole property worth £7. The other two youths kept watch while the other went inside and stole £2 in cash along with an automatic pistol and a magazine of six cartridges. As the youths left the house they were seen. Two ran off in one direction and the youth with the gun in another. PC Megson stopped the car he was driving and approached the youth who was on his own, and when about 12 yards away the youth drew the pistol and pointed it at him telling him to keep back or he would shoot. The officer continued to walk towards the youth, and when about two yards away the youth pointed the gun at hi stomach and pulled the trigger. The firing pin struck the cap of the cartridge in the chamber, and the only reason it did not fire was the owner had cleaned the gun and left oil in which had got on to the cartridge. A passing motorist Mr. Robert De Lucia stopped and although warned that the youth had a gun helped the officer to restrain him. The motorist was also commended by the Judge.